To add insult to injury, Ali was sentenced to five years in prison and a $10,000 fine, stripped of his passport, and banned from boxing at the height of his career. Perhaps they thought that they could silence him, break his spirit, or simply render him unable to earn a living at the height of his powers. But they underestimated the man who earned the title, The Greatest of All Time, for his prowess in and out of the ring. A proud member of the Nation of Islam, who worked closely with Malcolm X, Ali fought for his integrity by speaking truth to power. “Those Vietcongs are not attacking me. All I know is that they are considered Asiatic black people, and I don’t have no fight with black people,” Ali said. Sure enough, his fight was with the United States government. He took the case all the way to the Supreme Court. In 1970, the court overturned his conviction in an unanimous 8-0 ruling, with Thurgood Marshall abstaining from the vote. Vindicated, Ali got back in the ring and in doing so, he forced the world to put some respect on his name. Last June, Ali died at the age of 74. He truly was the People’s Champion and the greatest athlete of the twentieth century. In honor his unparalleled legacy, ATLAS Gallery London presents Ali the Greatest: Harry Benson | Thomas Hoepker | William Klein | Steve Schapiro, currently on view through May 27, 2017. The exhibition begins in 1963, with a photograph by Steve Schapiro of the Olympic gold medalist who made his name know: Cassius Clay was a contender to be reckoned with. Schapiro went down to Ali’s family home in Louisville, Kentucky, when the boxer was just 21, and photographed him walking around town with a Monopoly board under his arm, playing with local kids. This image provides insight into Ali’s true nature: a man who loved the people, and the people loved him. He understood the importance of community, and the way it created strength, not just for his name and reputation but for the people themselves. The simple act of human grace can never be underestimated and Ali knew this. He also knew how to play the game. He understood the media and never turned a reporter or a photographer away. He not only enjoyed the attention; he loved to control the narrative. 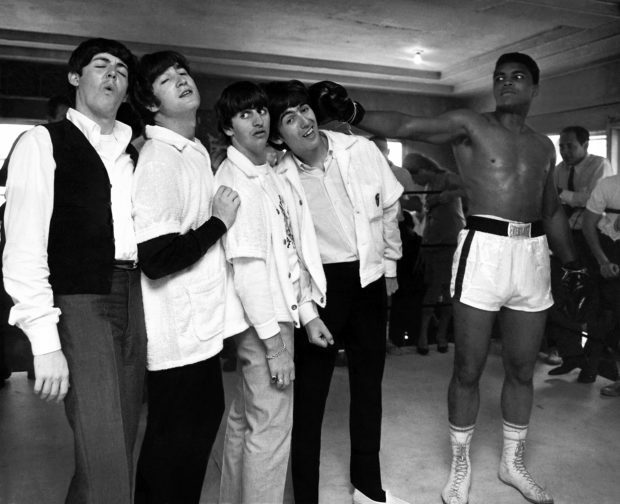 Harry Benson’s 1964 photograph of Ali meeting the Beatles is the perfect example of his personal dominance. The photograph shows Ali delivering a “punch” to the mop-tops, knocking them down like dominoes. Word has it that John Lennon was incensed at having been portrayed in this manner but he was subservient to the forces that made him appear the weaker man. 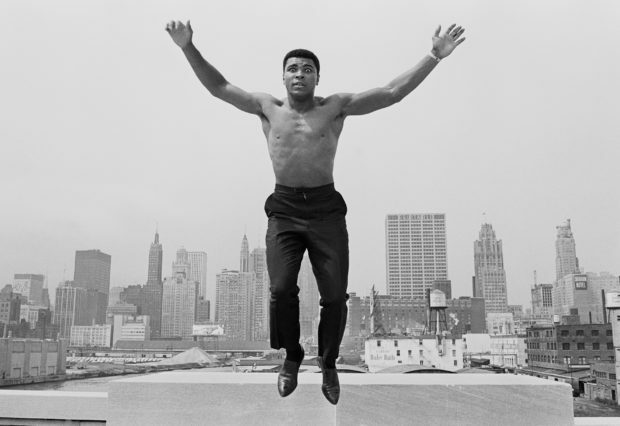 In 1966, Magnum photographer Thomas Hoepker was given exclusive access to Ali in London, Chicago, and Miami, revealing the many sides of the man: whether jumping from the bridge over the Chicago River or frightened by a bee on a film set. 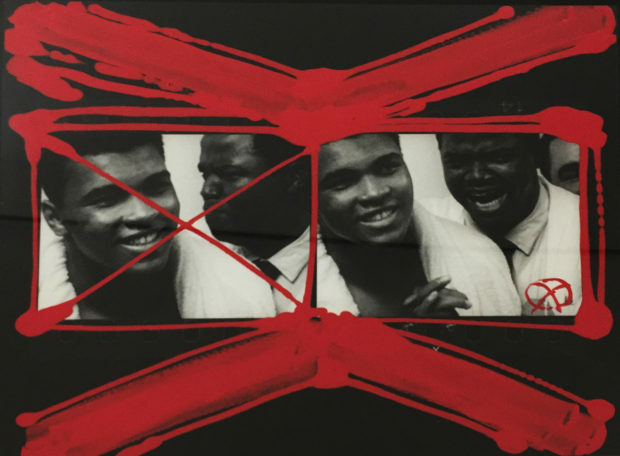 The exhibition concludes with two film still collages from William Klein’s 1974 film, Muhammad Ali: The Greatest, which reveals Ali’s evolution from sports champion to political and cultural icon. It was this same year that Ali regained his title by besting George Forman in “Rumble in the Jungle,” the first fight organized by Don King. It was a touchstone in more ways than one. Embracing the ethos of the Pan-African movement, banked by a $5M payout from Zaire President Mobutu Sese Seko, 1974 became a turning point for Ali as he restored his title, thereby transforming from world champion to living legend. His return to prominence superseded anything any athlete had ever done. Like Dr. Martin Luther King, Jr., Ali has been lionized by the very people who vilified him. In looking back, it behooves us to remember why he was hated so much: he spoke truth to power, and he never once bowed to the forces that would try to extinguish his light. © Harry Benson, ‘Muhammad Ali Hits George’, 1964, Courtesy Atlas Gallery. 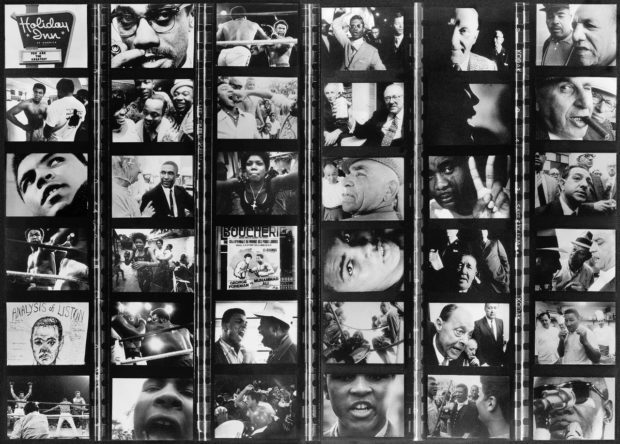 © William Klein, ‘Film Still’, Courtesy Atlas Gallery. 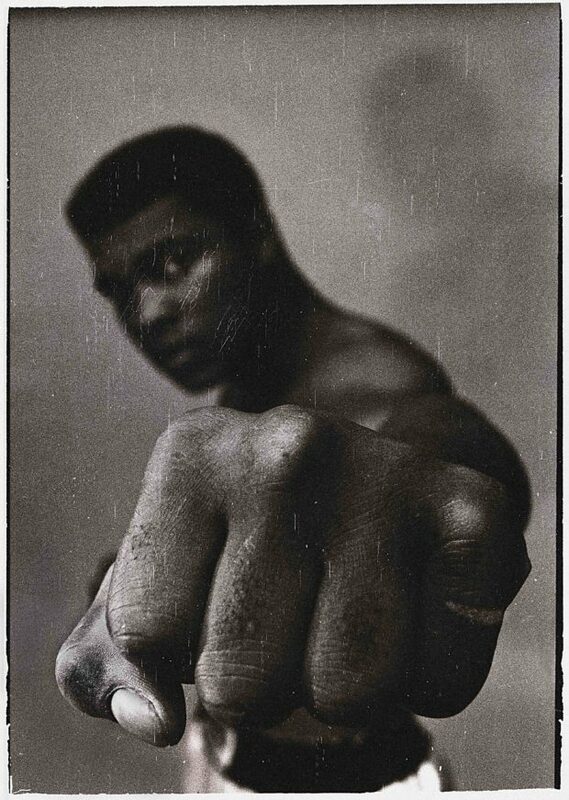 © Thomas Hoepker and Magnum Photos, ‘Muhammad Ali, Left Fist’, 1966, Courtesy Atlas Gallery.